Prime Minister Infinity – Canada v. 3.0.2 sneak-peek for Windows and Mac has been released! This sneak-peek is a major update. 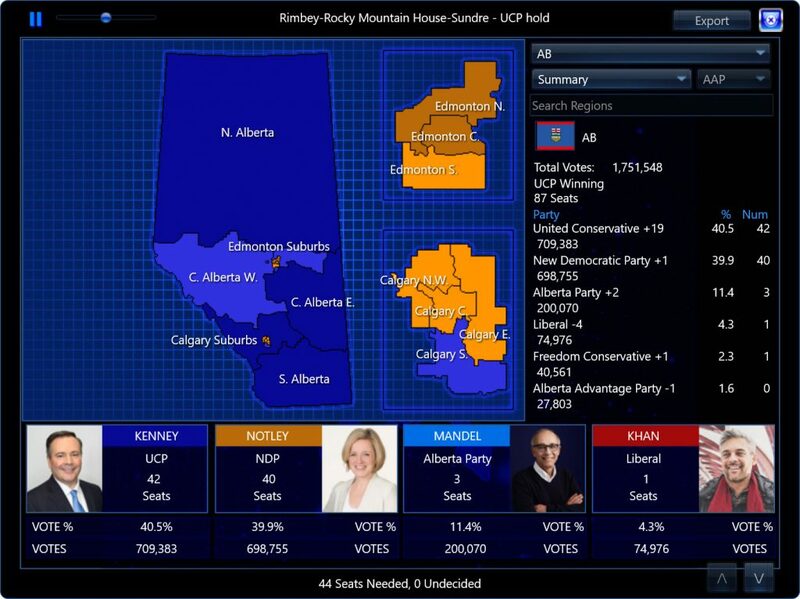 It adds Alberta – 2019, attributes are now 0-10 instead of 1-5, introduces Favorability, shows info on the map when you move the mouse over a region, allows for increasing the size of the window, and more. For more Alberta – 2019 info, go here. If you are a Prime Minister Infinity – Canada owner on subscription (or if you purchased President Infinity within the last year), you are eligible for this upgrade. What’s new in this upgrade from the previous release (v. 2.7.9b). President Infinity v. 3.0.0 sneak-peek for Windows has been released! 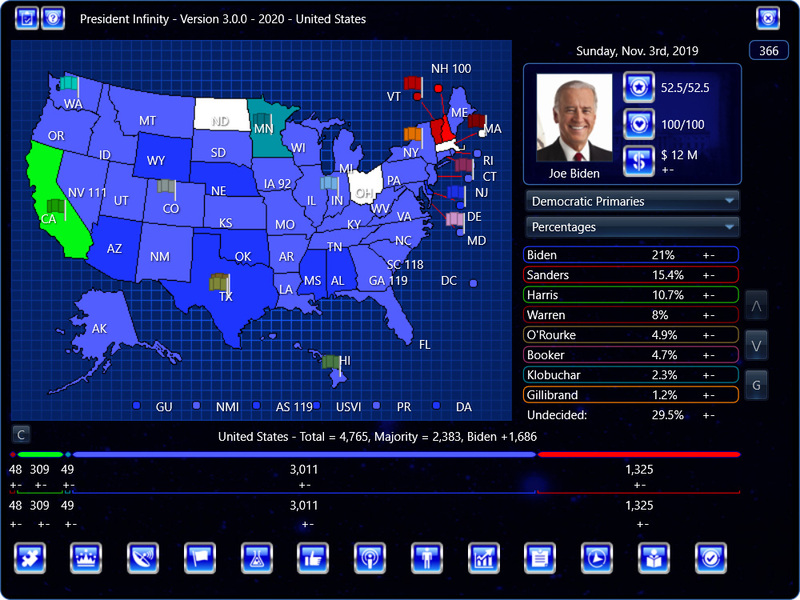 This sneak-peek adds 2020 (80+ candidates, 5 parties, 28 issues), improves electoral dynamics to keep party %s relatively consistent when starting from primaries, makes debates matter more, fixes a 0% undecideds bug, improves computer player AI, and more. What’s new in this upgrade from the previous sneak-peek (v. 2.9.9). President Infinity v. 2.9.9 sneak-peek for Windows has been released! This sneak-peek adds Party Identification to each eligible voter (a given party, independent, or alienated) and Party Identification Strength (committed, leaning), and in particular if a voter is committed to a party, all candidates running for that party get +25 to their Favorability score, if voter leaning for a party, all candidates running for that party get +15, and fixes a bug where VP who is also endorser could take back endorsement of player is VP of. If you already own an Infinity game, you can get another one for just $9.95 (regular $15-20). Simply purchase ‘Add another game’ with the below button, and then follow the instructions to specify the game you want. Orders are processed manually, so please give 1 business day for fulfillment. 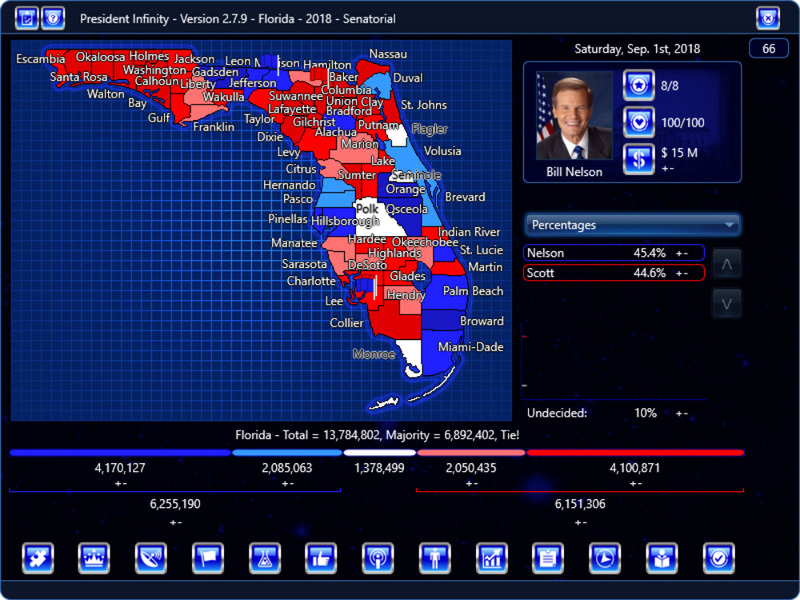 President Infinity v. 2.9.6 sneak-peek for Windows has been released! This sneak-peek reduces memory usage and improves speed, fixes a couple bugs with the Sim Screen, and more. What’s new in this upgrade from the previous sneak-peek (v. 2.9.5). President Infinity v. 2.9.3 sneak-peek for Windows has been released! This sneak-peek adds the Favorability system, a complete replacement for the underlying electoral modeling in the game. It allows for more accurate greater-than 2 candidate voter dynamics, including rapid ascents and collapses. It does this by modeling scores for each candidates for each voter (the highest score is the candidate the voter will vote for, assuming it is above a threshold), where the electorate is modeled to the 1/10,000th, allowing for a high degree of segmentation. Since this is such a big change, things are still being fine-tuned. One challenge is keeping voters ‘in their party lanes’ during games that start in the primaries, and this will continue to be worked on. What’s new in this upgrade from the previous sneak-peek (v. 2.9.1). This new feature for campaign designers will be introduced in Congress Infinity, and then rolled out with all the other games. President Infinity v. 2.8.2 released! 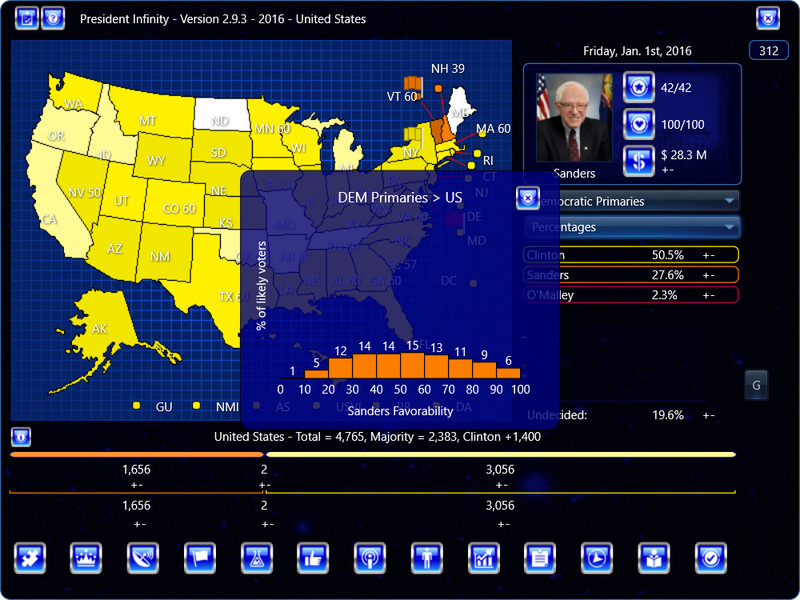 President Infinity v. 2.8.2 for Windows and Mac has been released! If you are a President Infinity owner, you are eligible for this upgrade. This is a preview intended for feedback, in particular any features you think should be top priority. We are currently finishing up the Summer 2018 cycle of releases, with a new President Infinity and Congress Infinity to be released in a few weeks – this will be the next cycle after that. Note that United States – 2020 is planned for Winter 2018-2019 release, after the mid-terms. Networking is planned for after that, and applies for all products. See President Infinity 1., 2., 4.-6.